Templenet is an online journal as well as a comprehensive encyclopedia on Indian Temples. It is intended to serve as a one stop source of information on these monumental pieces of work. This website is targeted towards different classes of audiences - the resident and non resident travellers wishing to tour the Land of Temples - the armchair tourist - those with a serious interest in archeology, history , religion and mythology - and simply to anyone with an interest in Indian culture. This site will be a pointer to thousands of temples in India and will provide information related to travel and accomodation to both casual and informed tourists alike. features the online journal that will be published on a bimonthly basis. Reviewed articles relating to Indian Temples will be published in this page. 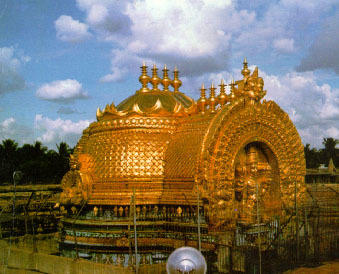 This page will also feature announcements regarding prominent Temple Festivals and Fairs in India. What is the Templenet Encyclopedia? The Templenet Encyclopedia is a comprehensive directory of Indian temples with comprehensive information describing the various aspects of these temples. How is the encyclopedia organized? At the first level, Temples are classified by region. For example, the classification Temples of Kerala refers to all temples in the state of Kerala while the classification Temples of the Himalayas refers to temples in the states of Himachal Pradesh, Jammu and Kashmir and Upper Uttar Pradesh. At the second level, there are listings with brief descriptions of each of the temples. These hyperlinked listings will take the users to the final level of detail covering all information related to location, architectural, historical, mythological and special significance and so on. How frequently is the encyclopedia updated? The Templenet Encyclopedia is being updated regularly. The header at the top of the Templenet Encyclopedia will show you the month and year in which it was last updated.Owing to the sheer magnitude of the information being handled, you will not see all listings immediately and you will observe the encyclopedia to grow with time. This page contains information on access and accomodation at focal points in close proximity to the Temples of interest. The other pages on Indian Temple Architecture, Fairs and Festivals and Myths and Legends contain descriptive articles that will provide a general perspective on Indian Temples. The Glossary provides a listing of terms related to Temple Architecture and Culture in Indian languages along with their meaning. Templenet provides you with an opportunity to share your articles and photographs with a worldwide audience. If you are interested in submitting articles or photographs for publication in this online journal, please send mail to webmaster@templenet.com . You will be provided with the appropriate instructions.